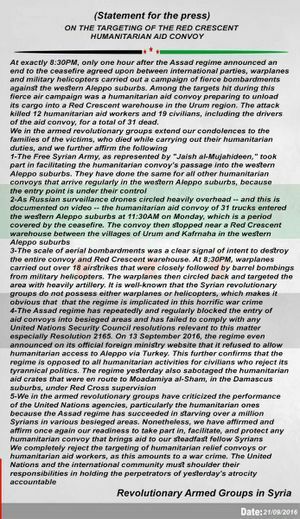 This is my critique of the evidence, analysis and conclusions drawn by the Bellingcat article Analysis of Syrian Red Crescent Aid Convoy Attack authored by Nick Waters and Hady Al-Khatib and published on the Bellingcat site Sep. 21, 2016. 1.1 Assertion: Knowledge of location means guilt and Russia knew! 4 Bellingcat analysis: What happened during the attack? 4.1.3 Hell Cannon Propane Tank Bomb? 4.2.1 What could have caused this damage? 6.1.1 Who is the FSA today? Do they still exist? 6.1.2 Who is fighting in and around Aleppo if not the FSA? 6.1.3 So who issued the FSA statement used in the Bellingcat analysis? 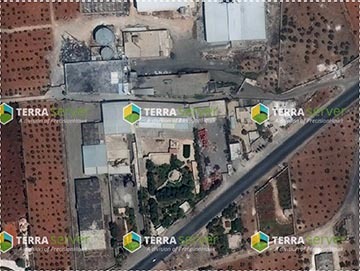 This investigation will use open source techniques to demonstrate that the Russian MoD and Syrian Government knew the location of the convoy. It will also show that it was not a fire that destroyed the convoy, but a sustained attack by air assets. Assertion: Knowledge of location means guilt and Russia knew! The first point about the Russian MoD and Syrian Government knowing the location of the convoy is hardly incriminating. I agree they both knew all along and well before the convoy was even underway - despite any subsequent drone surveillance confirming that. The Syrians, Russians and rebels knew because the Syrian Arab Red Cross (SARC) and the United Nations relief people TOLD them all exactly where the convoy was headed beforehand and got the required approval from all parties for the route/destination. It was traveling to a specific existing SARC aid distribution warehouse and health clinic in the outskirts of Urum al-Kubra, not some secretive location that could only have been discovered by surveillance drones and spy satellites. The United Nations Office for the Coordination of Humanitarian Affairs released this statement by Stephen O'Brien right after the attack, part of which clearly states: "...Notification of the convoy – which planned to reach some 78,000 people - had been provided to all parties to the conflict and the convoy was clearly marked as humanitarian..."
And this from the Amnesty International site: "The UN aid chief, Stephen O’Brien, earlier said that the convoy was travelling with all the necessary permits, and that all parties in the conflict had been notified of its route." The Guardian reported "...After it entered opposition territory, it was monitored by Russian drones, a fact acknowledged by the Russian defence ministry, which had also been provided with precise GPS coordinates of the route to be taken and the destination, as per agreement with Syrian officials..."
There is no doubt Russia knew where the convoy was. Waters and Al-Khatib seem to dwell on the availability of secretive drone-derived locations as some kind of proof of guilt when the route and destination where well-known by everyone beforehand, yet they curiously avoid mentioning this fact. In their calculus, it is only important that Russia knew. "The Russian reconciliation center aims to assist armed groups in Syria in concluding ceasefire agreements, maintain the truce regime, control its observance and organize the delivery of humanitarian cargoes to civilians. The center has existed since the beginning of the year and part of its mission is to monitor aid convoys, including this one. This responsibility with regard to the Urum al-Kubra convoy extended into neutral/rebel-controlled territory to a certain point, beyond which the rebel forces assumed responsibility to ensure safe passage of the convoy to the final destination. The Russian MoD was trying to express that they had fulfilled their part of the agreement for monitoring at 1:40 PM local time, and beyond that it was up to the rebel forces to monitor the convoy's further movement and protect it. The convoy (or part of it) was already at the warehouse by then, so it wasn't going anywhere - it was starting to unload. The Russian MoD statement was widely mis-represented in the Western press as some feeble attempt by the Russian MoD to claim ignorance of the convoy's route and destination and additionally claim that only the rebels could have possibly known where the convoy was. Taking these statements completely out of context and failing to mention the Russian Center for Reconciliation and their assigned role, one would think the MoD's statements were indeed disingenuous. The MoD was, in fact, addressing their responsibility to monitor the convoy and the end of that responsibility at 1:40 PM - it was not an attempt to claim ignorance of where they clearly knew the convoy was located: at the warehouse. Waters and Al-Khatib are simply using evidence manufactured from poor journalism to suggest deception on Russia's part. This is used to reinforce their previously stated contention that Russia knew where the convoy was, therefore they must have bombed it. The remainder of the article's thesis regarding 'sustained attack by air assets' will be addressed in the sections below as they present their evidence. I'll merely point out here that the Russian MoD had looked at the initial social-media (activist/White Helmet-provided) video when they made their comments about the appearance of the convoy. Those initial handful of pictures did appear to show nothing but burnt/damaged trucks and little of the surrounding area. The Russian MoD spokesman was speaking specifically to the accusations that Russian aircraft bombed the trucks. He (rightfully so) said the pictures they had seen at the time looked burnt, not bombed. He would not have made that exact same statement a day or two later when more and better-detailed pictures emerged. Bellingcat is again presenting the Russian MoD's statements out of context and without regard to what pictures they had actually seen at the time - all this in an attempt to make them sound deceptive or defensive when they were (according to Waters' and Al-Khatib's analysis) already guilty. The information they present in this section regarding location/time is accurate and reasonable. "...However, a comparison of pictures from the aftermath of the attack and the drone feed clearly show that the convoy did not move on: it was attacked at the location that the Russian MoD was monitoring..."
There were two separate Russian drone 'missions' that day. One was the obligatory convoy monitoring by the Center for Reconciliation until it got to the destination warehouse. The Russian MoD says this occurred at 1:40 PM local. There was another 'mission' (or perhaps a second drone) that did a general reconnaissance of the area until around the local 6:30 PM sunset. While there is video of the warehouse/convoy at times, this (second) drone seems to wander about looking at the surrounding area for long periods of time. In other words, it's not intensely focused on the now-parked convoy and unloading process. It's doing what a recon drone does for any military and had an obviously different task than the dedicated convoy monitoring one. The Russian MoD reluctantly released that in their own defense after accusations that they were responsible for the bombing and the misinterpretation of the Center for Reconciliation statements. This is actually quite extraordinary - you would never see the U.S. military release their drone footage for anything other than self-promotion. Nonetheless, Russia offered it as "See - the aid convoy and warehouse were fine the entire time we were watching (even though we were not obligated to watch it). Whoever attacked it only did so after we stopped monitoring it" Waters and Al-Khatib miss the entire Russian MoD motivation for even releasing the second set of drone footage and instead sees this as more 'evidence' that Russia did it. Not sure why Bellingcat insists on hammering the MoD for the statement about only rebels knowing where the convoy was after it reached the warehouse. Russia did not expect it to go anywhere. The knew it didn't go anywhere. They were not literally suggesting it did go anywhere else - like to some secret rebel-only-known location. I'm curious if the translation itself was flawed. But even if it was perfect, I see nothing insidious in it given the context. This is far too much attention on a single confusing sentence considered out of context to prove malice on Russia's part. Bellingcat has somehow interpreted Russia's subsequent monitoring of the warehouse area as suspicious and incriminating, rather than standard military stuff. This is used to bolster their argument that Russia knew = Russia guilty. I'm just completely missing their train of logic here if there is any. Bellingcat analysis: What happened during the attack? Waters and Al-Khatib have no idea what video the Russian MoD has examined up to the time they made that statement. I'm assuming Russia does not yet have a time machine, so they were looking at some of the initial video/images on social media. 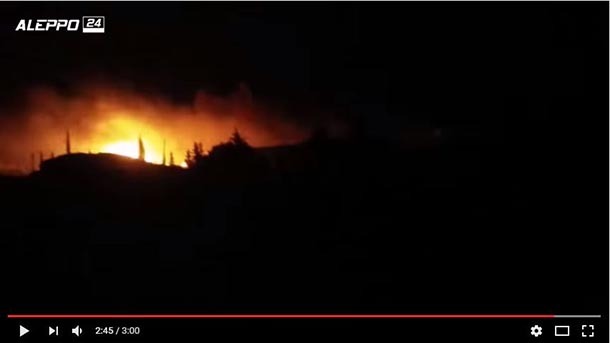 My guess would be the night-time White Helmets video of the site, in which little of the actual damage could be seen. Waters and Al-Khatib reference a lot of media that came out after that, suggesting (once again) that Russia is lying about what the authors can clearly see a day or two later. A series of images follow which proport to show "...Konashenkov’s statement is simply not true..."
I'm no explosives expert, but I am just not seeing a crater that should have resulted from 200+ kilos of TNT/ANFO impacting vertically at maybe 600 km/hr. If this was suppose to be a dud, then I'm not seeing any of the un-exploded 200+ kilos of TNT/ANFO nor remains of the giant welded-up pipe section they make these out of nor any remains of the large, crude fins they weld on these bombs. There's a very brief view of what looks like a piece of bent 6 cm or so pipe at the 1:25 mark in the source video. At the 1:29 mark, the narrator pulls out a circular dusty white piece of metal, which Bellingcat suggests is the front piece of a barrel bomb. This 'barrel bomb crater' is a few meters from the back of two heavily-damaged trailers, so something certainly exploded there. The last few seconds of this video pan across the street in front of the warehouse/aid station. The crater has been filled in with rubble (tan color) near the back end of the rightmost two trailers seen just before the video fades out. I don't see any definitive evidence of a barrel bomb here, and certainly not in the size nor with the explosive potential they are commonly made. The white piece of metal could have been from a (nicely painted?) barrel bomb, or it could have been from a Hell Cannon or an IED - or it could have been completely unrelated to the explosion. According to the White Helmet video narrator, there should be seven other barrel bomb craters to examine, yet we only have this one. Something big seems to have exploded there, but there's nothing obvious that leads me to believe it must have been a barrel bomb. Inconclusive at best. I don't know of any Russian air-dropped munition that would produce that meager of a crater (even if a dud). The debris isn't recognizable as anything Russian-bomb related, nor would I expect that big of anything that actually exploded to remain. If it was a dud, the White Helmets would have had video of the crumpled casing all over the internet by now. To be clear, we're talking about the roadside crater just outside the front gate, not the one inside the warehouse. Standard Russian High Explosive/Fragmentation bombs are the OFAB-100/120 and OFAB-250/270. They are only fuzed for point detonation - they have to hit something first to explode. So without any proximity or air blast option, I would expect a distinctly cone-shaped crater of a meter or two in depth. And no miscellaneous metal chunks at the bottom. This was not caused by any Russian air-dropped munition (although the authors contend it was a barrel bomb). Hell Cannon Propane Tank Bomb? Of course Waters and Al-Khatib would avoid examining this option because it would imply the rebels attacked the aid compound, not Syria/Russia. Hell Cannon munitions are usually metal propane tanks filled with a crude explosive - usually prilled (little ball-shaped particles of) ammonium nitrate, a common fertilizer in Syria, with other additives like fuel oil, aluminum powder or charcoal. They often contain nuts, bolts and nails as shrapnel. The propane tanks themselves are manufactured of two hemispheric halves welded together. When they are used as a cannon-launched bomb, they hit on end with some kind of fuze (usually an old mortar fuze) in the center of the nose-end. The explosion rips the tank in half at the weld and flattens the front half against the ground or inside of it's shallow crater. It flattens like one-half of an orange peel would flatten: by splitting somewhere from the edge to the center. Kind of like the piece they dig out of the shallow crater in the video. The damage is pretty consistent with the blast from such a home-made bomb. In other scenes of the surrounding street, there appear to be a lot of what look like white ammonium nitrate prills but it's hard to tell for sure. This is hardly any kind of substantial proof it was a Hell Cannon, but I would contend equally or more likely (based on the crater) than a barrel bomb. These are often made from prilled ammonium nitrate like the Hell Cannon bomb. I bring this up because the crater location is very close to where the front gate would have been. Maybe this was just a raid by rival jihadis and they didn't have a key for the front gate, so they used an IED 'opener'. The other damage to the trucks/compound could have been a battle for the booty. The point here is that it does not have to have been an aircraft-dropped or cannon-launched explosive. The damage and crater are consistent with what one would expect from an IED. Was it? I don't know, but it's more evidence that diminishes the certainty that the evidence proves it had to be a barrel bomb. I can see something may have exploded here, but I can't accept the authors' contention that it must have been a barrel bomb. There are too many other credible alternative explanations. What could have caused this damage? Obviously not something small like a mortar or RPG. A barrel bomb, and air-dropped munition, a Hell Cannon or an IED could all take down the wall of a building like this. Is there any way to tell which specific munition based on the apparent damage? Not from the picture alone. The only conclusion we can make is that something exploded here and took down the wall. It looks like. Which makes sense since this truck was facing the main gate crater/bomb. What I don't find credible is that if anyone in the Russian MoD saw this picture, they would claim otherwise. I have to conclude they never saw a detailed, daytime picture of all the obvious shrapnel damage when they made the statement about all the damage being from fire. 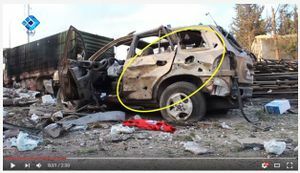 Another odd thing is that the particular sections that Bellingcat has circled in yellow on their analysis show obvious evidence of bullet holes. Shrapnel does not makes nice, perfectly-uniform and round holes in patterns like that. Even if there were something like 12mm ball bearings in an IED, the dispersal pattern wouldn't be so regular. An automatic weapon fired straight into the cab looks like that. The obvious question is: Who was shooting up the front of that truck either before or after it was burning? That would be evidence supporting something like looters attacking the compound to get at the aid. The hole size and pattern are not conveniently explained by either Russian aircraft (much larger rounds) or Syrian helicopters (helicopters shoot from above, not parallel to the ground like a standing human does). Obviously. Again, if the Russian MoD had seen this exact picture (with their time machine) then they wouldn't have made any remarks about 'no evidence of a fragmentation bomb'. The shrapnel could have come from any manner of bomb that exploded in the compound, so it's not conclusive as to the type of bomb. Nothing that looks clearly like bullet holes from an automatic weapon, but there is one fairly large circular hole near the wheel on the rear drivers-side door. Hard to tell if it has any significance from this picture alone. 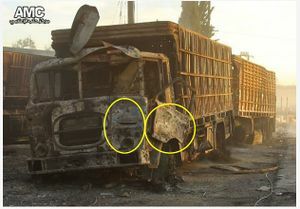 The larger 'holes' are not shrapnel, but the missing door handle and gas tank lid (burnt?). This was the local SARC director's SUV and he was fatally injured in it during the attack. One additional thing I found odd is that the air bag is deployed. The interior compound blast was maybe fifteen meters away. I'm having a hard time picturing a bomb blast or shrapnel from the side of the car triggering the air bag. Not sure what that means, but not relevant to the analysis or my critique in any case. A second Bellingcat article was published on Sept. 22nd, Confirmed : Russian Bomb Remains Recovered from Syrian Red Crescent Aid Convoy Attack, followed the original Bellingcat analysis. I will critique that article separately and address the specifics raised by the OFAB-250/270 tail piece recovered from the crater. There are too many details that need explination specifically with regards to this purported 'evidence'. Among many inconsistencies to be found at this scene, we have the primary one of is this a tailpiece of an OFAB-250/270 (yes) and could it have landed here as a dud (no - discussion in follow-on critique) or could it have landed here and exploded (no - discussion in follow-on critique). My conclusion is that it could only have been present in that crater if it had been placed there intentionally to give the appearance that it landed there. It was used to stage the scene to give the appearance of a Syrian/Russian air attack. This speaks volumes to the credibility of anything the White Helmet/Media Activists have produced about this attack, including the other primary piece of evidence: the video. Nonetheless, I'll treat the rest of the evidence/analysis in this critique as objectively as possible without regards to this tailpiece issue. I agree with the statements the authors make on what appears to be obvious fragmentation damage. "...Although something like a gas cylinder could cause some blast and fragmentation, the level of damage show here, and in a multitude of other photos and videos, indicates something much more powerful..."
I do not agree with the above statement - numerous videos of Hell Cannon propane tank bombs show powerful explosions that cause significant damage. The propane cylinder bombs are a good 15 or 20 kilos of ANFO or other nitrate-based explosives and are often loaded with metal scrap for shrapnel. While not as powerful as TNT, they can still take down the brick wall of a two-story building and throw shrapnel 50 meters. This alone is not proof that Hell Cannons or propane tank IEDs caused the damage, but it suggests that it was much more likely one of them than conventional Russian air-dropped high-explosive/fragmentation munitions - a possibility for which we have not seen any convincing or credible evidence. I reject the authors' contention that the crater outside the main gate was caused by a barrel bomb, and that the crater inside the warehouse was caused by an OFAB-250/270. The staging of the warehouse crater calls to question the motives and credibility of all the White Helmets/Media Activists evidence. "...A White Helmet at the scene of the attacks makes two different claims. In the Video 1 he claims: “The regime helicopter targeted this place with four barrels”. In Video 2 the same man claims: “Regime helicopters targeted… with eight barrel bombs” and then states that the “regime targeted this place with cluster bombs two times… with C-5 [presumably referring to S-5 air-to-ground missiles] and with bullets”..."
"...Although he may be referring to information he has just received, there is no immediate evidence that the latter claim is correct. However, the claims of barrel bombs and helicopters is consistent, especially examining the crater and debris in Figures 7 & 8. Furthermore, the object–likely a bomb’s tail fin– identified in Fig 13a appears to be from an OFAB 250-270, a piece of ordnance delivered from the air by jets..."
The problem with the analysis here is obvious. Certain parts are discarded for lack of evidence, then other parts are 'accepted' based on the specious conclusion that barrel bombs must have been used. 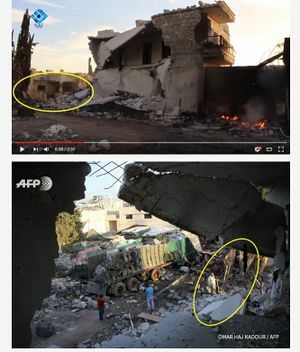 These two video segments are of the same White Helmet at the same location at slightly different times making two different claims. The only evidence provided during the video is a single, shallow crater with a round, flat plate buried inside. The analysis makes no mention of the 'missing' barrel bomb craters, the absence of any helicopter sounds or the fact that a few hundred kilos of TNT produces craters a meter or two deep and widespread destruction. Then there's the question of credibility for any claims of White Helmets who apparently moonlight as al Nusra soldiers (or perhaps the other way around). One of their videos has pretty distinctive jet aircraft-like sounds during the attack, so I find it odd that they would initially claim helicopter-dropped barrel bombs. Barrel bombs are not dropped from Syrian jet aircraft as far as anyone knows or has ever observed. The second Aleppo24 (rebel media) video with the jet aircraft sounds is examined next, but no mention of the broad inconsistencies of the two is made. 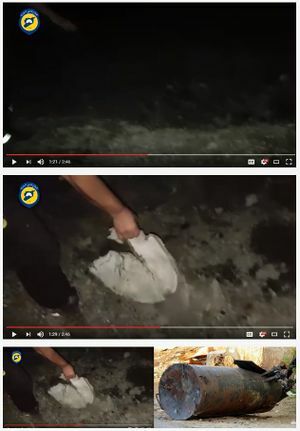 The second video's middle segment is of the White Helmet workers rescuing people at the site, but they seemed concerned a second (or third?) airstrike is possible without giving any reason for their concern. At one point, they are convinced it is coming and warn everyone away. It's nearly impossible to hear jet aircraft approaching you on the ground before an airstrike and know that they are - in fact - flying directly at you and/or will attack you. Possible, but you usually only hear them as they pass over the location. This was at night in a somewhat noisy location (fires, other vehicles, rescue efforts). I don't know what to make of the machine gun/C5 rocket comments. It almost seems like that was from a different attack somewhere else and simply tossed in here for effect. The video with the machine gun noise and rounds hitting the ground is from a different location than the one with two big explosions and the White Helmet rescue effort. Either there were two completely different groups of White Helmets miraculously filming the attack simultaneously or these are two different attacks presented as the Urm al-Kubra attack. Someone asking if the airstrike was 'within their airspace'. This is an extraordinarily bizarre comment. Who witnesses a nearby (supposedly) ground strike and then asks if it was 'within their airspace'. The person on the video is already claiming there were 10 airstrikes - who's 'airspace' did he think they were coming from? This is not something a foot-soldier asks or says. Then this equally bizarre comment: "..Person 1: Tell them we are an ambulance, tell them we are an ambulance… wait a minute, wait a minute….. Allahu Akbar …. Tell him they have destroyed the aid trucks, they have hit the aid trucks..." What? Tell who? Were they in contact with the pilots? Or were they warning fellow al Nusra not to mortar/Hell Cannon them because they were arriving in their ambulance? This sounds like some kind of attack gone bad and they were not intentionally targeting the aid trucks, but unexpectedly did. It sounds like they were warning the people firing munitions at the compound not to hit them in the ambulance. That would explain this person's comments far better than some random White Helmet observer giving a play-by-play of a Russian air attack. The last odd exchange: "...Person 5: Inform us, inform us …; Person 6: They are going to execute the airstrike, they are executing it….." Who talks like that? These people were supposedly at the site. First, how did they know anyone was going to 'execute' and airstrike on them? Secondly, you are worried about the bombs, not the operational description of the task. A normal person (provided they could even know this) would have said "Watch out - they're dropping the bombs" not "they are executing an airstrike!" Granted, these were people in the vicinity of some very large explosions and they were excited, but this sounds too much like people trying too hard to convince the viewer what was happening rather than someone just explaining what was happening. If any more proof of that is needed, I'll offer the last curiously precise comment in the transcript from a person watching the attack at night: "...Person 1: Allahu Akbar …. Allahu akbar …. Allahu akbar….the Russian airplanes has executed an airstrike on the UN’s aid trucks in “Aurem”..." Who needs any evidence when you have an eye witness with night vision? Conclusion: Wildly inconsistent and speculative without any discernible basis. This actually works against the White Helmet's credibility in many ways, but we have to give these guys some leeway - they're not professional news readers or military analysts sitting in an air-conditioned studio. Still, there's just too little here to go on and nothing that - by itself - is going to add credibility to other more compelling evidence. 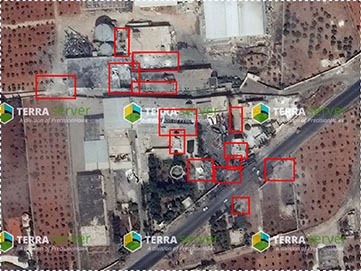 The visual analysis seems directed at verifying that the explosions on the White Helmet 'Aleppo24' video are, in fact, at the location of the SARC warehouse compound. This is difficult to accept for a few different reasons. The only evidence provided seems to be an outline of the sloped, stepped warehouse roof similar to that seen on a warehouse directly to the north of the compound. From the explosion's flash to the actual sound is roughly two seconds, so the observer is approximately 660m north-northeast of the compound. The warehouse seems out of proportion considering the distance from the observer. The distance from the front gate of the SARC compound to the corner of the warehouse is only around 80m, so the video camera is another 7x that distance to the NNE. This may just be the effect of a long zoom. Let's say it's possible, but it's fairly weak proof (by itself) of what we're looking at. The explosion is huge - this looks like an IED, not an air-dropped bomb. IF that was, in fact, an air-dropped bomb, then I would easily expect a crater in the order of a couple of meters deep. The flash ball is almost as big as the entire warehouse. It would have had to be something much larger than a Russian OFAB-250/270, which itself would produce a crater a couple of meters deep. Perspective and relative sizes odd? At the end of the Aleppo24 video is a second explosion, but there are no visual cues as to where that was taken. It appears to be in extremely hilly terrain or some odd shaped buildings which doesn't appear to be anywhere near the SARC compound and definitely not where they were standing before. There are other longer videos with this perspective/segment that include 'jet aircraft' sounds and also have tracer rounds of a machine gun/auto-cannon striking the ground nearly vertically in front of the camera operator. This issue will be discussed in detail elsewhere in the main ACLOS Wiki as it was not presented by Bellingcat in their analysis. 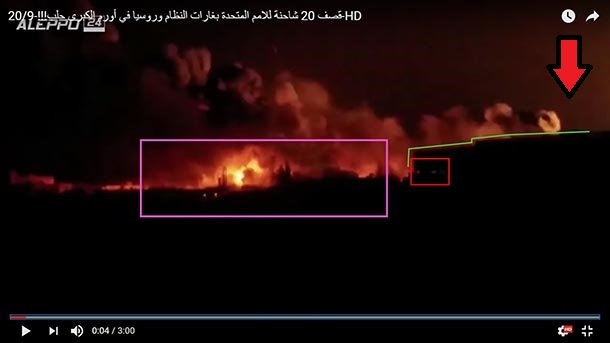 With regards to Bellingcat and the veracity of the video, I'll just point out that it appears (hand motions, narrative, color balance) that this was taken by the same person that recorded the first explosions segment. The odd thing here is the general issue of how the White Helmets knew a second 'airstrike' (or whatever kind of attack it was) was coming again, and they were able to evacuate over a half-kilometer away and still have time to jump out of their car and tape the second segment of explosions. Why did they move? Is this even the Urm al-Kubra SARC compound any more? The large white-roofed warehouse at the top of those images also has a substantial hole in the roof not visible in the current Google image. It appeared well before this fall, but someone bombed it for some reason. What kind of activity is going on around there that everyone wants to bomb everything? Have the rebels been fighting each other over something in those warehouses before? That wouldn't be proof of anything of course, but one has to consider that there may be a perfectly good reason for the rebels to attack the location, and it may have had nothing to do with SARC or the aid trucks - they were just in the wrong place at the wrong time. 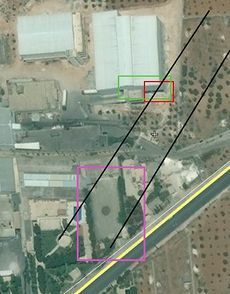 Conclusion: Bellingcat has provided some evidence that there were explosions at/near the SARC compound based on a White Helmet video and narrative. The video adds nothing, however. We can clearly see from news video the next day that there were explosions in the SARC compound. What we can't see is any evidence of cratering which is absolutely expected with any conventional HE/frag air-dropped munition. And there were not just three 'big explosions'. There were many in that area big enough to take down buildings outside the SARC compound, yet no visible craters anywhere in the satellite imagery. So we have the White Helmet 'jet sounds' and narrative, yet nothing. [Except for the suspicious hole-in-the-roof/crater inside the warehouse. That will be examined more thoroughly in my critique of Bellingcat's follow-up analysis which focuses directly on that.] The White Helmet's credibility in these eye-witness reports is questionable. Based only on their claims and this video, I am not seeing anything close to solid proof that this was even an air attack, much less a Syrian/Russian one. Bellingcat next provides a statement issued by the FSA denying and condemning the attack. I'll dissect the statement below, but it should be mentioned that FSA is largely a fictional organization today - a remnant of the U.S. and coalition PR campaign to cloak the overthrow of Assad and Syria's current Baathist-led government as a popular uprising. It is apparently issued from Jaysh al-Mujahideen, the few thousand 'moderate rebel' leftovers operating around Aleppo. Who is the FSA today? Do they still exist? While the FSA myth is kept alive in the western MSM, it has little organization or dedicated following on the ground besides a few small islamic militia batallions. There are a few individuals claiming various leadership positions in the FSA outside of Syria, but these are mostly London-based opportunists that have little to do with anything going on directly on the ground inside Syria. They function more like front-men and Western puppets for remnants of the mostly-defunct FSA. Who is fighting in and around Aleppo if not the FSA? In the Urem al-Kubra area, various smaller groups are effectively aligned with Harakat Nour al-Din al-Zenki (al-Zenki). Al-Zenki had split off from the former FSA-aligned groups in years ago because of perceived Muslim Brotherhood (i.e., Qatari) influence. Al-Zenki has since joined various coalitions of brutal, Saudi-backed jihadists operating as Jaish al-Fatah (JaF). Al-Zenki have themselves been accused of numerous human rights violations, including the well-publicized video showing the beheading of a sick child for supporting Al-Zenki's enemies. JaF is a Turkish and Saudi-supported coalition of hard-core jihadists including al Qaeda and al Nusra factions. A number of Al-Zenki jihadists were relocated from Idlib and Aleppo to Turkey's southern border to stop the advance of Kurdish troops and fight ISIS. The MOM calls these troops FSA, but these Turkish Al-Zenki jihadis have no relation to the original FSA or its goals of a secular Syria. JaF seeks the subjugation of the Syrian population (at least in areas it 'liberates') to an Islamic Caliphate lorded over by a severe and extremist version of Saudi-exported Wahhabism. The FSA is dwarfed by the JaF coalition. The above explains why 1) anything issued by a fictional FSA (and not by their main component: Jaysh al-Mujahideen, is immediately suspect, and 2) the FSA does not speak for al-Zenki, al Nusra or JaF the 'other' and much larger/powerful group operating in the area who (in general) are at odds with the FSA. A statement by JaF or al Zenki would have had far more importance, but neither group has issued any such statements. Al Nusra and JaF have already expressed various objections to delivery of UN and Red Crescent aid. They primarily object to aid originating and loaded in Syrian government-controlled areas (such as the Urem al-Kubra convoy). They prefer aid from organizations operating in Turkish territory and immune from inspection by international aid agencies and Syrian government representatives as they enter Syria. One does not need much imagination to understand their motivation for such an arrangement. They have plenty of motivation to attack aid convoys 'protected' by the FSA and have stated their desire to do exactly that. So who issued the FSA statement used in the Bellingcat analysis? It's technically not an FSA statement despite claims by both Bellingcat and the source Charles Lister [tweet] linked by Bellingcat. I assume one of the many PR firms hired by Western/GCC interests to garner public support for anti-Assad forces authored this FSA-styled statement and released it under the unheard of and nebulous 'Armed Revolutionary Groups in Syria'. The content appears identical to the initial narrative pushed in the western MSM: "The Assad 'regime' did it." That narrative has since mostly morphed into: "Russia did it" today. I would have to believe forces pushing the western/GCC agenda were responsible for this 'statement'. True - they control the checkpoint into rebel-held territory. What they cannot claim is that the territory beyond that is JaM or FSA controlled or that the FSA had any part in protecting the convoy beyond the checkpoint. They simply allowed it to enter rebel territory, that's all. The FSA/JaM are merely one of the many gangs competing for 'rebel held territory' or have overlapping/conflicting claims of specific control. Al Zenki (therefore JaF) is the most significant and pervasive rebel power in that region - they could make a far more credible claim of control of Urem al-Kubra than the FSA or their militias. True, but irrelevant for identifying the parties involved in the later attack. Russia had every reason to monitor the convoy until it reached its destination. That is not remarkable or unusual, and everyone involved knew where the convoy was headed whether they had drones or not. I'm not sure who this 'drone evidence' is suppose to convince. Nobody sees the relation here because there is none. And keep in mind that at the time this statement was released, the narrative was that the Assad regime did it, not Russia. Only if we accept the White Helmet videos and accounts as fact and ignore the missing or contradictory evidence of any aerial attack by either Syrian forces or Russia. Using that logic, we could conclude that bullet holes in the trucks could not have been caused by Syrian or Russian forces who have no people on the ground in that area, therefore the rebels are responsible. At the time, Russia had claimed that a U.S. Predator drone was over Urm al-Kubra at the exact time of the attack. I find that a little more incriminating that the prior Russian monitoring. False. The Syrian government refused to allow uninspected aid convoys from Turkey. Since Turkey is directly supporting both the rebels and ISIS, one can understand the Syrian government's reluctance to let convoys cross into Syria from Turkey without inspecting their cargoes. Turkey has refused to send aid convoys if the cargoes will be checked by Syria. The text of this item also reiterates an unfounded claim that the Syrian government sabotaged aid bound for Moadamiya. This is suppose to offer additional proof that the Syrian government opposes humanitarian aid for besieged areas, but ignores that this very aid originated from government-controlled areas. Syria could have just denied any aid to Moadamiya if they objected to it, but we are somehow suppose to believe they permitted it but sabotaged it anyway? Plays on the ridiculous notion that the Syrian government would permit the assembly and loading of aid convoys in its own territory and then sabotage/bomb them later on if they are headed to rebel-held areas. These are the same aid organizations and trucks that - at other times - serve civilians in government-held areas. This reminds me of the preposterous claims that Syria would wait until the U.N. chemical weapons team was physically in Damascus before they would (supposedly) launch a chemical weapons attack on East Ghouta. A fantastic claim considering the FSA and/or Jayish al-Mujahideen - at best - control certain small villages/areas in Aleppo province (and only if otherwise ignored by an Nusra/JaF). They have neither the backing nor the military might to protect or control much of anything in Aleppo province. If al Nusra/JaF are the real military authority in the Urm al-Kubra, then why is the FSA/JaM even controlling entry at the checkpoint and promising convoy protection? Al Nusra/JaF already object to such aid for Aleppo city itself - the FSA/JaM has nothing to say about it. Did the U.N. and SARC get al Zenki's permission to send aid? Did they ask al Nusra? Whatever the left-over FSA thinks about it is mildly interesting, but irrelevant. Call for the UN to punish the regime for war crimes - based on the FSA's flawed assumptions and pre-identified guilty party. This has recently changed to charging Russia with war crimes because the 'regime' evidence of guilt fell apart. Of course, if al Nusra, the FSA or JaM is ultimately found responsible, then there will be no prosecution. The al Zenki child beheaders are still fighting in the al Zenki ranks on the Turkish border today - there will be no UN war crime tribunals for that act of inhumanity. FSA Statement Overall Conclusion: The FSA-like statement offers nothing new other than a reiteration of the western MSM narrative's initial set of specious claims. There is nothing offering any proof, much less any credible evidence of motivation. Not only is it devoid of fact and meaningless for identifying the responsible party, it is quite misplaced in any so-called 'analysis'. I suggest that it's a rather clownish concrete example of confirmation bias and damages whatever marginal credibility the Bellingcat analysis purports to offer the reader so far. I understand why they would put this in their analysis, I'm just having a hard time believing that they actually thought it would be a good idea to do so. "...Further to the evidence presented above, anonymous US officials told Reuters that “two Russian Sukhoi SU-24 warplanes were in the skies above the aid convoy at the exact time it was struck late on Monday”. Due to the nature of this claim it is impossible to verify using open source investigation, but it does not contradict information uncovered during this investigation..."
Claim: My pet monkey can talk. That also does not contradict information 'uncovered' in Bellingcat's investigation. Conclusion? "...Though the Russian Ministry of Defense earlier refuted claims that the attack on the convoy was an airstrike, it changed its tune on Wednesday, suggesting that a U.S. Predator drone was responsible for the attack. This claim is not consistent with the photographs and videos at the scene of the bombing and in its aftermath, including the roar of jets, the remains of barrel bombs, witness accounts, and an OFAB tail fin..."
So Bellingcat is claiming that ANY suggestion by Russia is wrong (or a lie) if it does not agree 100% with the evidence selected by Bellingcat as important - all of which was provided by al Nusra-linked White Helmets which means unverifiable and biased. Even if the White Helmet evidence could be trusted (doubtful), it is wildly inconsistent and questionable at best. Of course, Bellingcat feels it necessary for the Russian state to prove the White Helmet claims of it's guilt are somehow wrong. Yes, that's as odd as it sounds. Russia suggested the U.S. (or crony's) Predator was somehow involved. I don't believe they claimed a turboprop Predator with two Hellfires could somehow be entirely responsible for all the destruction. Their point was some kind of U.S. involvement and/or foreknowledge of the attack, not that Russia had produced a fine-grained analysis identifying the exact weapons and methods involved. Both are true but inconsequential. 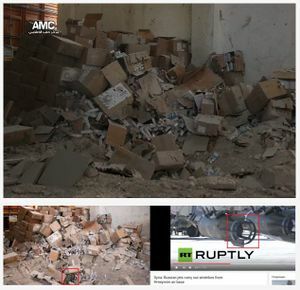 JaM and al Zenki knew the precise location of the aid convoy - they claimed as much during their video of the attack. The U.S. and coalition partners would have known where the convoy was and where it was unloading. In short, every single party involved in the conflict in that area knew where the convoy and warehouse was. This was not secret, specialized knowledge proving any one of them was guilty or innocent. I'm not sure why Waters and Al-Khatib obsess about this so much throughout their analysis. It begs the question over and over again: So what? The exact same argument applied to U.S./coalition forces or rebels as the culprit would be equally weak. Someone would have to know where the convoy and warehouse were to attack it, but everyone knew. The authors have failed to convince me of the relevance of this to some kind of proof of Syrian/Russian responsibility. But the authors backtrack further down in the text when they say, "...The aftermath pictures, as well as the footage of the attack, clearly indicate large, explosive weapons were used..." I agree with this statement, but I am still trying to see how they reconcile that with 'airstrike' and 'barrel bomb'. The next sentence states, "...There are at least two craters (Fig 7, 8 & 11a and Fig 13), a multitude of fragmentation, and serious damage to at least one building..." Which I also tentatively agree with, but ANY large explosive weapon is likely to produce craters, building damage and shrapnel damage. Hell cannons, large mortars and RPGs can produce that same kind of damage as well, which the authors curiously ignore - not even a cursory mention. The authors have not made any convincing arguments for proof of an airstrike save for their last item of conclusion (below). Which is where we get to the meat of the Waters/Al-Khatib argument, which requires one to believe a video made by one of the belligerent parties accusing (at times) either one of two other belligerent parties (or both) of the attack. Now that fact alone does not mean the evidence (video/audio) are fake, but one must employ at least a modicum of skepticism and critical thinking in light of the potential bias. What is most suspect is the content itself: the totality of how the White Helmets present the events in the video, the inconsistency of what they present, the editing of scenes and how they leave out much detail that one would expect to be included. If one does not accept the credibility of the video, then the entire Waters/Al-Khatib analysis falls apart. Everything hinges on the credibility of a specious White Helmet video. "...In short, the most likely perpetrators of this attack are those who knew of the location of the convoy and have the means and motivation to carry out an air strike and helicopter barrel bomb attack. Considering the presence of a tailfin of a Russian-made bomb, the presence of a Russian drone monitoring the location, and the barrel bomb attack, it is almost certain that Syria–and possibly Russia–carried out the attack..."
Syrian jets weapons systems use daytime-only targeting systems. They do not have any known (nor has anyone ever observed any) night-time attack capability - only Russian aircraft have such systems. Russia, on the other hand, has never used their attack helicopters for dropping barrel bombs. There's absolutely no reason they would. Barrel bombs are a uniquely Syrian improvised weapon dropped from Syrian helicopters. If one is to believe the White Helmet narration and subsequent evidence, then one has to accept some kind of coordinated joint Syrian/Russian attack on the warehouse compound. This makes it all the more difficult to believe, and the 'unnamed White House officials' made no mention of any helicopters which should have been just as clear on their radars as the supposed Russian Su-24s. "...There are no indications in the open source evidence that corroborate Russian claims that the damage took place from a “fire” on the ground (not initiated by an airstrike) or that a U.S. Predator drone could have been responsible..."
Russia was making a claim (at the time) based on just the White Helmet video (the first media released) and nothing else. I would have made the same claim based on nothing but that. Much better quality daytime video and images came out the next couple of days AFTER the Russian statement that gave more clues as to what happened. Using those later images as 'evidence' to suggest Russia was lying is disingenuous at best. If Russia had nothing to do with it, then they can hardly be expected to provide evidence the next day proving what really happened and who did it - they were just as confused as everybody else. Once again, I have to question both the White Helmet's and Bellingcat's treatment of the extensive fires - quite obvious in the videos. There was no evidence of any incendiary weapons used and regular fragmentation/high explosive aerial weapons do not start fires like that. Russia thought that was quite significant (so did I), yet not a word about them from Waters and Al-Khatib or the White Helmet video narrator. Not even a guess as to what caused them. That is quite odd considering the fire's prominence in the video and on the scene. "...This incident was a deliberate, sustained attack on aid workers using information provided for their protection..."
For what is offered as an analysis, this is a sad bit of demagoguery to close. It may as well have read: "It was the evil and conniving Syrians and Russians who did it, and they in a most cowardly, malicious and inhumane way!" I have a hard time keeping an open mind about their observations and conclusions when they chose to reveal so much of their bias like this. Nonetheless, in my opinion, their analysis - as it stands - is weak at best. incomplete and does not support their conclusions in any convincing fashion. This page was last edited on 17 October 2016, at 12:25.